Liam Dennick Fishing : Saturday 23rd January. 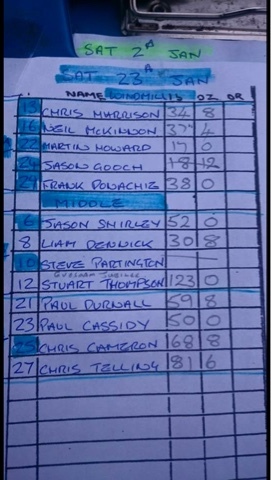 Manor Farm Open - Middle pool peg 8. This can be a good area but can be very hit and miss and for some reason I didn't have a good feeling about it! Kept things very simple as I always do. 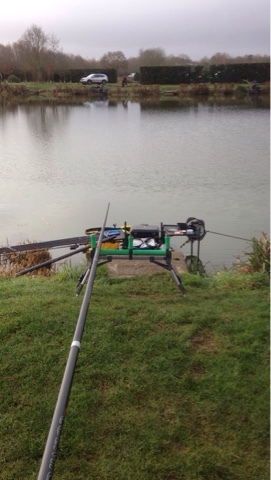 Fed my pole line at 13 with pellets then chucked my Colmic Next adventure 45 rod with popped up bread. As i put the rod down it wrapped round resulting in a liner which was very promising! Anyway to cut a very frustrating few hours short I didn't have a single bite or liner until 1:00 when the float gentle dipped and a 3lb skimmer was in the net. I shipped my Colmic F33 back out and lowered in my rig... Fish on! Had 8 proper skimmers in 8 put ins so was glad of some bites! Then the skimmers completely disappeared so set up a new line to my right and rattling in a few pellets and sat on this for 15 minutes without a bite! Went back on my original line and after a couple of minutes of working the rig the float slid under and a 2lb F1 was soon in be net. With around an hour to go I knew I was well behind but continued on this line and the stockies rocked up. Caught around 15 of these tiny little bars of gold until the all out. Weigh in saw me have 24lb of skimmers and 6lb of stockies. Giving me 30-8-0. Nowhere overall but was glad of some bites late on!